Assured Automation announces a new line of VAX High Pressure Coaxial Valves for applications that require fast actuation, and strict durability and reliability. These compact automated valves combine a process valve and actuator in a single integrated unit with only one moving part. The VAX valve has a coaxial design offering high flow rates with minimal pressure loss, while extending the VAX’s cycle life by as much as ten times that of conventional valves. The electric version of the VAX functions like a direct acting solenoid valve. Durability is a key advantage to the VAX valve. These valves do not leak, coils do not burn out. Shut-off speed is fast, occurring in as little as 0.25 milliseconds in either direction. Its pressure balanced design with spring return allows the VAX valve to function regardless system pressure or pressure differential on either side of the valve. The valves are available in 2-way or 3-way configurations with pressure ratings up to 600 PSI. Since the VAX valve works with the forces of flow instead of against them, it is suitable for most vacuum, gaseous, gelatinous, highly viscous, pasty, aggressive or contaminated, or recycled fluids and gases from vacuum to 600 PSI. 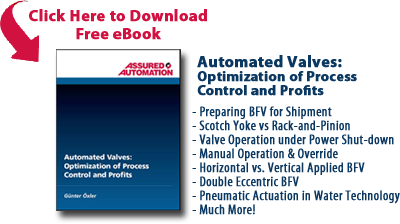 Their ability to be customized makes the VAX valve a preferred solution in difficult applications. 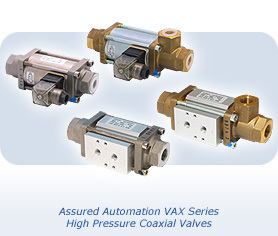 The VAX valve is available in electric and pneumatic versions. Direct-acting or air-actuated versions as well as two-way valves are available in brass or SS; 3-way valves are available in brass. The valves come Normally Open or Normally Closed. The VAX valve is particularly well suited for high cycle applications. For example, a dying plant in Shoemakersville, PA uses a 140-foot long fabric dryer in their fabric dying process. The conventional solenoid valves used to control the natural gas jets in the dryer’s built-in burner was failing too often. Their internal diaphragms became brittle and frequently broke, slowing down the fabric dying process. The VAX valve’s wear-compensating seat proved to be the right solution, with its lower probability of catching fire and is lower susceptibility to decay under increased oxygen conditions. The 110-foot fabric dryer equipped with 12 burners and 36 valves, drying fabric at the rate of 25-75 yards per minute, has been in continuous service since the VAX valves were installed over two years ago, with no maintenance. About Wolf Dye and Bleach Works, Inc.
Wolf Dye and Bleach Works is a privately-held textile and finishing company, located in Shoemakersville, PA. The company has been featured on the Science Channel’s “How It Works” series. Its manufacturing capacity includes cotton, polycotton, and synthetic blends, dyeing and bleaching, napping, finishing open width and tubular goods as well as garment dyeing. This entry was posted in Industrial Laundry/Washing Equipment, Latest News, New Product Announcements and tagged Compact Automated Valves, Electric Valves, High Pressure Coaxial Valves, Pneumatic Valves, VAX Series. Bookmark the permalink.